Timbre Inde 2019 - Abonnements à Nouvelles émissions Inde Neuf sans charnière - Freestampcatalogue.fr - Le catalogue de timbres en ligne gratuit avec plus de 500,000 timbres. By adding a New Issue Subscription to your shopping basket you will be able to receive all* officially-issued new postage stamps and mint souvenir sheets (automat stamps, booklets and minisheets are not included) from the country of your choice. The initial amount required to be paid serves as a deposit and will be returned to you if and when you cancel the subscription. If requested, your subscription can be extended to include one or more of the following options:- stamp booklets, minisheets, automat stamps, first-day envelopes, maximum cards (only a few countries) and postal stationery. The prices we show on our website for subscribed new stamps include a 5% subscription discount. Delivery will take place up to 12 times per year, depending on the number of issues and subscriptions. The amount of new issues ready for you will be visible in your shopping cart when loggedin. 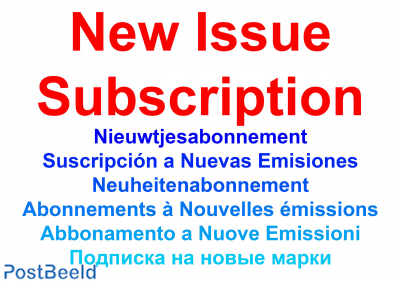 You can find more information about new issue subscriptions and a list of all available subscriptions here. * In principle we will deliver all new stamps subscribed for, provided they are supplied by the relevant postal organisations. In the rare case that a postal organisation does not deliver to us - or we receive only a limited amount - we will do our best to provide the required item/s via our various contacts, but we cannot guarantee delivery.